Raimundo Panikkar in his book Blessed Simplicity: The Monk as Universal Archetype, describes the monk (be it male or female, Christian, Hindu, Buddhist et cetera) as that “person who aspire to reach the ultimate goal in life with all his [sic] being by renouncing all that is not necessary to it.” While not contradictory to it, but better yet complementary to Panikar’s definition, Valters Paintner’s book is about the monk (be it male or female) embracing all that which in necessary to reach that ultimate goal, in a way that is wholesome, harmonious, life-giving and creative. The Artist Rule: Nurturing your creative soul with Monastic Wisdom is a catapathic book about life affirmation and celebration. This book came to my hands at perfect timing. As I am on summer break from my studies and I like to always take my breaks for some unhurried creative expressions. The book is a 12-week journey in which the author will be a companion in the artistic creative process sharing wisdom and practices from the Benedictine Monastic tradition. As I am working my way through the book, I realized that what I am finding meaningful at this moment, is not what the author has written but somehow the vibes of how it is written. The book is engaging in a roomy way. Coming from a monastic perspective in which time is a gift, it is not a surprise that the spirit of the book is calm and open. I find myself pondering quite a bit, writing on its margins and grabbing my journal to delve deep in those provoked thoughts. Yet because it comes from a monastic approach, the author emphasizes the words from St. Benedict, “ora et labora” (pray and work), making this a book of practices, not just warm thoughts. Done in a generous way the author aspire to move the reader from the passive consumption of words into the incarnational act of being creative. 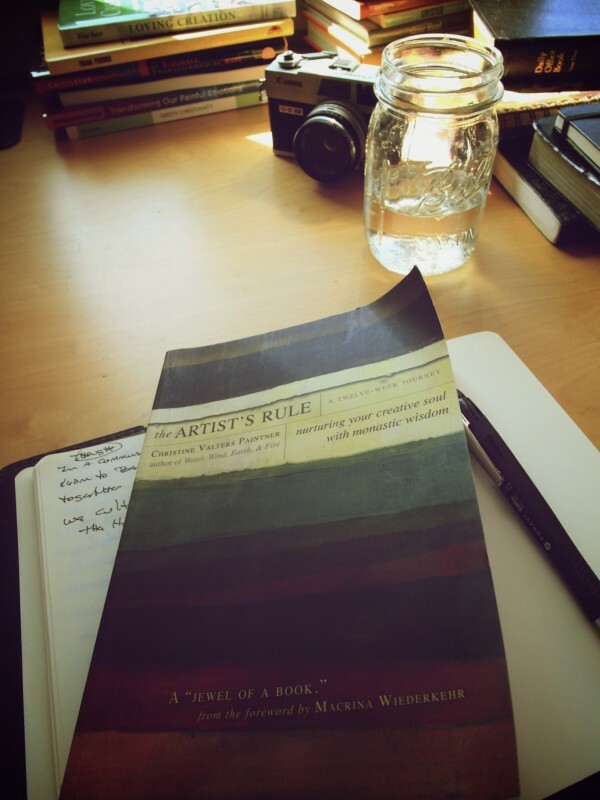 The gem of this book, in my opinion, is that the approach to the creative life is not done from a fragmented perspective, but it accentuates that the “primary creative act is the living of our daily lives, making it a work of art.” (p.16) It seeks to ground the creative process in the overall life experience of the person, the monk, the artist.